Summer Book Club post is coming tomorrow, don't worry! I actually devoured the book in a few days, so I'm all ready to go for our discussion! Part I is tomorrow, Part II is next week. I even returned the ebook to the library so that the next person on the waiting list could have immediate access to Catholic apologetics goodness. I'm also busy frantically preparing for our big summer festival this weekend. This year is a whole new level. I'm in something like 500 dances. 😂 I'm not really exaggerating by all that much, unfortunately. It's...a LOT. We're doing pop up dances throughout the festival both days, and then a 90 minute stage show on Saturday, 60 minutes on Sunday. I have many group pieces pervading, and then a solo on both days, a longer one on Saturday. The sheer volume of costumes and accessories that I need to pack is making me increasingly paranoid about forgetting something and/or generally screwing something up majorly. I'll be there close to 6 hours on each day. Pray for me. :0 I'm certain that I'll be reporting in on all of the amusing details next week! All right, so the BIG ANNOUNCEMENT! The book that I've been mentioning for about 2 years now, and working on for well over a year, is now in the printing process, and available for pre-order as part of a scripture study series for Catholic women! 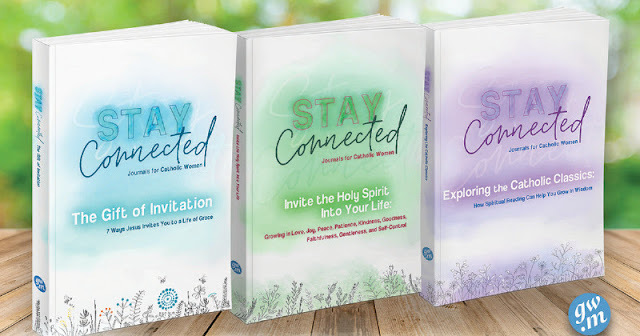 These books are down-to-earth, and easy-to-read, and are designed either for small group study, or from the comfort of your own couch with nothing but comfy clothes and a cup of tea as your companions on the journey. Each book has a different theme: the invitations of Jesus, classical works of Catholic literature, or the gifts of the Holy Spirit. 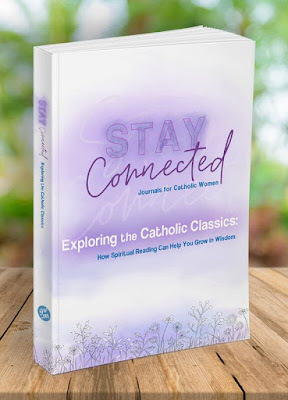 All 3 books are organized into 7 chapters with opening and closing prayers, reflections on the chapter topic (in the case of my book, a different Catholic classic is featured in each chapter), connections to scripture, and discussion questions. 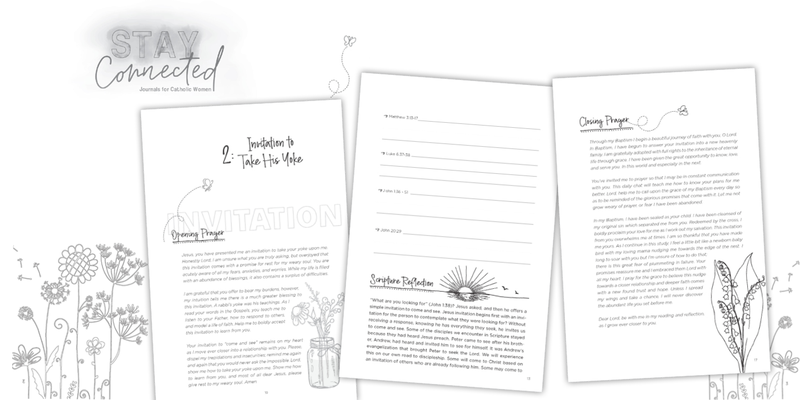 These have journal prompts and space built right into the book, so there is plenty of room throughout to record yours/your groups' thoughts and experiences. You can see this below in the delightful interior design! I could not be more pleased with how these books turned out. I plan to work my through all 3 as scripture studies and journals, and am just about jumping up and down with excitement! If you join the pre-order campaign, you will have your journal(s) in September! We are trying to gather initial printing costs for our lovely publisher, Gracewatch Media, and a successful campaign also means more journals will come out in 2019! The pre-order comes with MAJOR discounts for you. Each journal is available for $9 (25% off), or you can buy all 3 for just $25 (30% off). There are also bulk discounts available for each book, so you could also procure 3 copies of any 1 book for 30% off, 5 copies for 38% off, or 10 copies for 50% off! This is *perfect* for a Bible study group to go in on together! Domestic shipping costs are extremely reasonable as well. Ordering during the campaign also means that you'll get your journals way sooner than waiting for the full launch. If you'd like to support our humble campaign, I would be most grateful! These are marketed towards Catholic women, but I do truly feel that these journals are quite applicable to men as well! They also make great gifts for the women in your life. 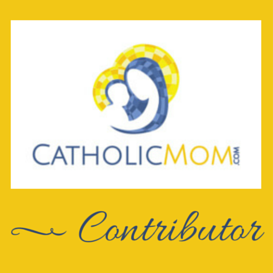 Do you need a daily way to delve into scripture? Are you a journaler? I'd love to hear from you! I'm so excited for these books and yay for online bookclubs! I have been wondering what that secret project was and when I hadn't heard you mention anything I thought maybe it didn't happen or something. Part II goes super fast, you'll whiz through it!